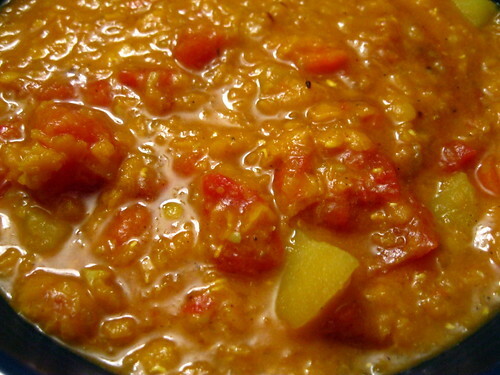 Curried Lentil Soup | Hapa...Shot the Food! 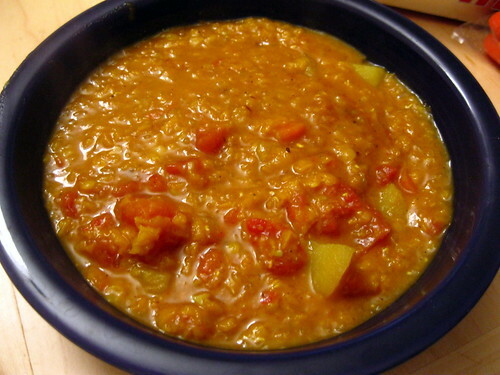 I wanted to try this recipe for a while, but opted for some Ethiopian lentil recipes first. This was the perfect way to use what lentils I had left over and was a great recipe for yesterday’s gloom and chill. 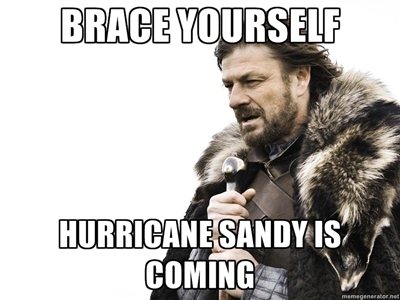 Oh, yeah… this was coming, too. 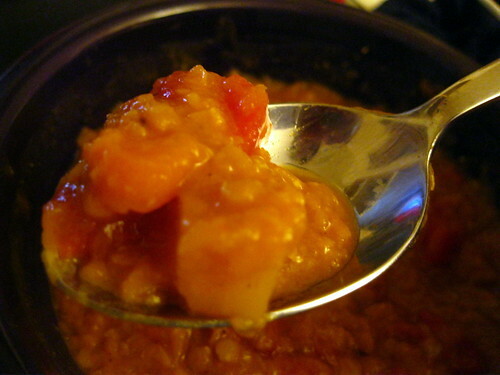 I’ll have the Ethiopian recipes up eventually, but here’s the recipe for the curried lentil soup I made last night. 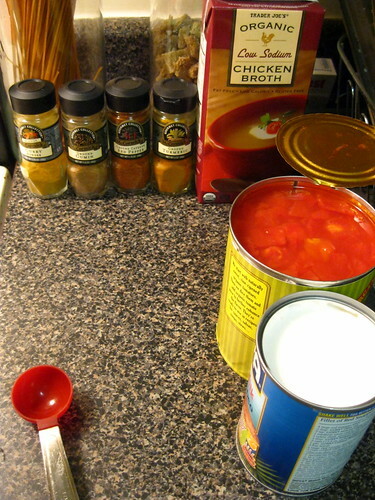 After reading the recipe reviews, I decided to add a few more things to the soup. I added several cloves of pressed garlic (seen above), increased the cayenne to 1/2 tsp., and added 1/2 tsp each of tumeric and cumin. Since I was a little low on chicken broth, wanted an extra layer of flavor and had it on hand, I also added a can of coconut milk (pictured below). Rest of the (mostly) step-by-step instructions behind the jump. Heat oil in heavy large pot over medium-high heat. 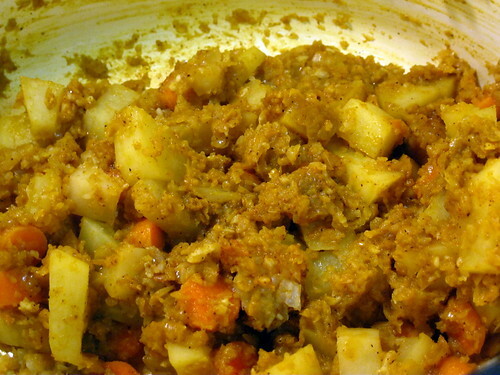 Add onion, potato and carrot and sauté until vegetables begin to soften, about 5 minutes. I also added the garlic at this step. Mix in spices (except for salt and pepper) and stir until fragrant, about 30 seconds. Add broth, tomatoes with juices, and lentils and bring to boil. I added the coconut milk at this stage, too. 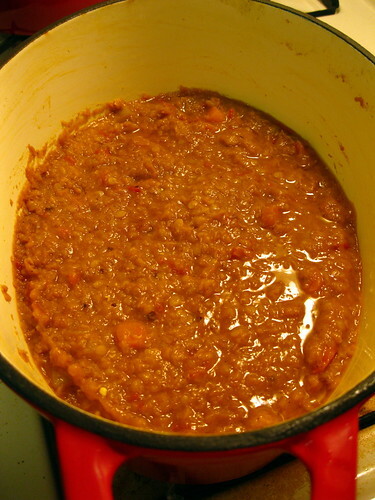 Cover pot, reduce heat to medium-low and simmer until lentils are very tender, about 45 minutes. Season soup to taste with salt and pepper. Here’s the finished product… a bit different from the golden-brown, milky liquid from earlier. 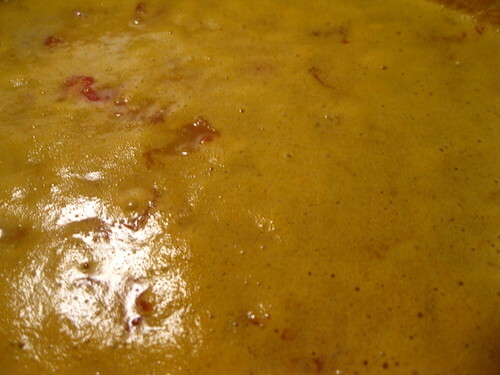 The scent of the simmering soup filed our apartment, a nearly intoxicating bouquet. I couldn’t wait to take a bite! The final product tasted as good at it smelled…spoonful after hearty spoonful. It was just a little spicy, but not intense. 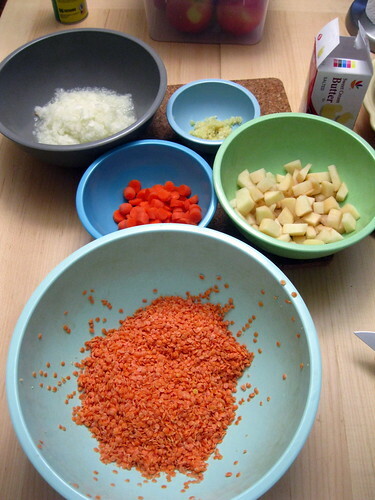 While I used red lentils here, you may use other types of lentils. If you use reds and don’t want your soup to dwell on the borderline of soup and stew, simmer for less time, about 30 minutes. As the instructions say, this soup can also be made up to 2 days ahead of time. If you do so, keep it refrigerated after it cools. 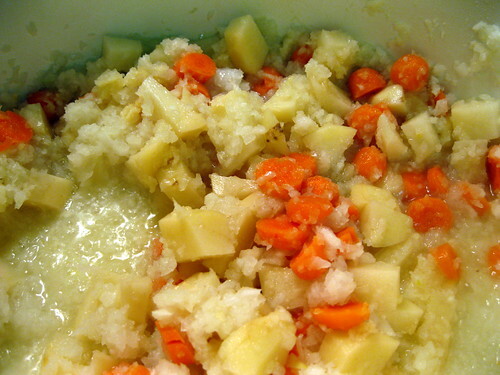 Posted on October 29, 2012, in vegetarian and tagged soup, vegetarian. Bookmark the permalink. Leave a comment.